The Independent Hearings Panel (IHP) has released its recommendations on the Auckland Unitary Plan. One of the ways the IHP is proposing to increase density is to reduce the Single House Zone (SHZ) by 22%. The SHZ is areas with relatively large sections that you are only allowed one house on. So these areas are effectively frozen in time, no growth will can happen and they will remain villages of sorts. Looking at this, it’s striking that the CBD is encircled by the SHZ. So the land it is closest to where people work, and therefore would benefit the most from increased density, is precisely the land that can’t be unlocked for increased density. While the map that everyone will be interested in today is the new Auckland Unitary Plan (AUP)….I have been playing around with drawing maps in R. The maps below use the 2013 census meshblock data set. Given all the discussion around NIMBYism that has surrounded the AUP process, I thought it would be interesting to look at where people actually own the homes they live in. 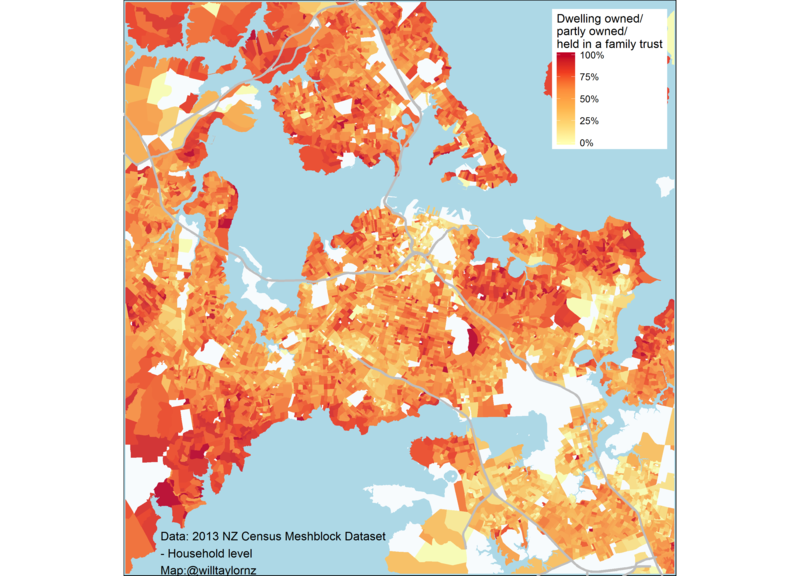 The first map below shows the proportion of households within a meshblock that either own/partially own the house or it is held in a family trust. 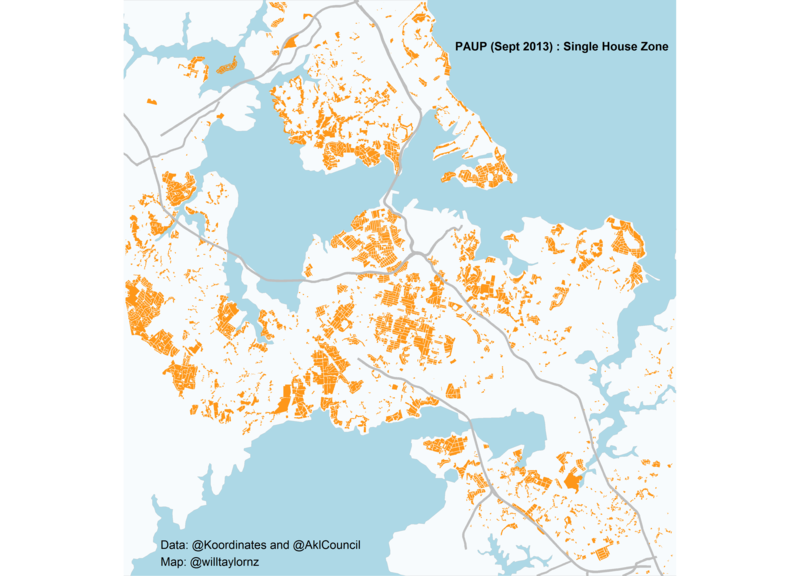 Including the latter category in my measure of home-ownership may cause some anomalies, such as with the leasehold land around Cornwall park. It will be interesting to compare this the AUP when comes out and see whether the are any patterns in zoning in areas where there is a high % of owner-occupied dwellings vs those where people rent (i.e. investors own the homes). The other map I pulled together uses household income data. For this map I looked at the proportion of households with an income over > $100,000. I.e. I was interested in “which areas had the highest concentration of wealthy households”. Again, pretty much shows what you would expect, higher concentrations of wealthy households in the inner suburbs and waterfront eastern suburbs. 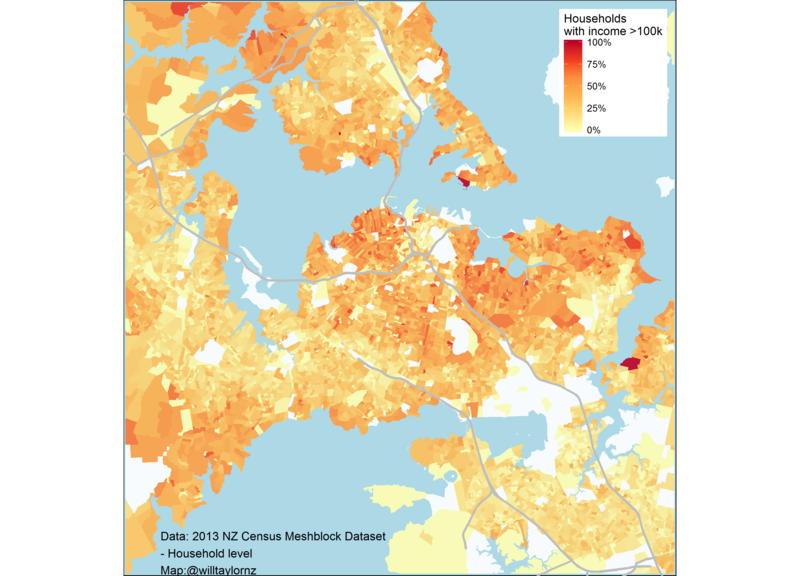 South and West Auckland on the other hand have lower concentrations of wealthy households. I was sitting around eating a date scone the other day when I ran into this article by Shamubeel Eaqub. The topic was central bank communication and whether the RBNZ (New Zealand’s central bank) was doing things well. Within a number of hours I’d been sent the link numerous times and had received a pile of feedback – with people on all sides fairly angry. This is an important issue though, so I thought I would note down my own thoughts while they are in my head. 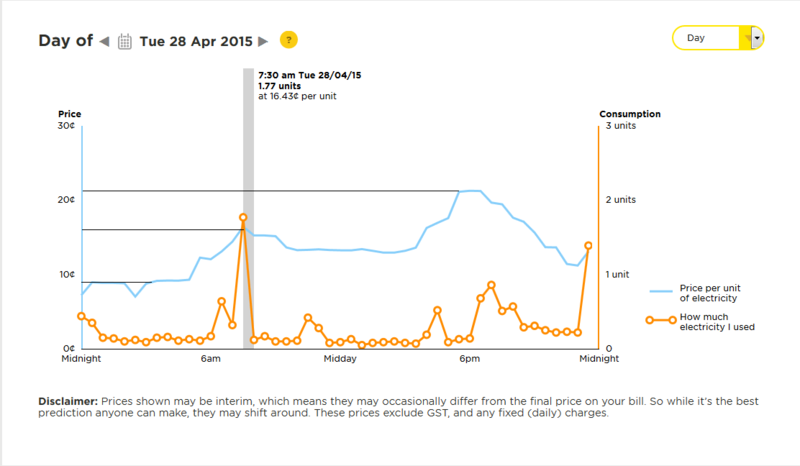 I’m pretty excited about the Tesla Powerwall, the home battery that was announced recently. People mostly think about home batteries as being important for solar. For residential solar, most of your generation is during the day when you aren’t home, so it gets sold back into the grid and therefore relies on the whatever the buy back rate set by your retailer is. If you are looking for practical tips for solar installation, check out https://enlytenenergy.com/top-5-things-you-need-to-know-about-running-your-home-on-solar/. These rates are lower than the retail price of electricity so the real benefit is if you can store the “free” electricity you generate in a battery and then use it during peak hours instead of paying for electricity, thus avoiding your variable electricity charge of 20-30 c/kwh. http://www.tvhe.co.nz/wp-content/uploads/logo-for-enfold-photoshop.png 0 0 Matt Nolan http://www.tvhe.co.nz/wp-content/uploads/logo-for-enfold-photoshop.png Matt Nolan2015-03-27 10:05:222015-03-27 10:13:03Dole bludger army?